For many people living in the country, owning a dog is a way of life. Most are not for hunting which is a controversial subject, but as a member of the family, a companion and a wonderful motivator for getting out of doors into the surrounding countryside and meeting local people in one’s travels. I have owned Labrador dogs most of my life and just like people, each one has a different personality, different likes and dislikes and so on but all have always been extremely faithful. Sadly my last dog passed away last September, She was 14½ years old which in dog terms is very old. As much as I miss her I know she had a great life and gave and received much joy to all who met her. There is little more one can ask for than just that. 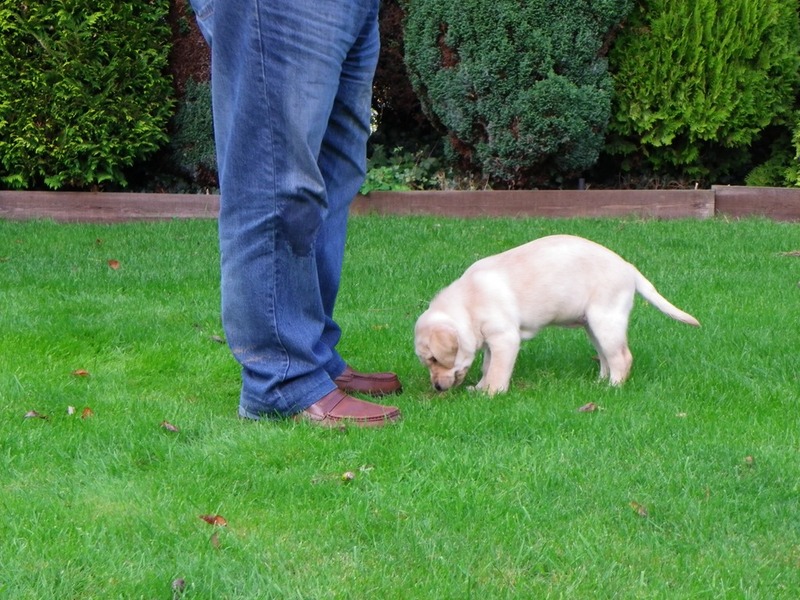 Now I have a new but rapidly growing Labrador puppy. Andrex type Labrador puppies are in huge demand but for the wise they are not something that can be bought off the market shelf. Puppy farms are to be avoided at all cost. Cute as an eight week old puppy may seem, one has to remember they are going to share your home and family for a long time. Puppies that are bred just to meet market demand, can also have the chance of inbred genetic defects. These can make both the dogs life and yours difficult in future not to mention costly veterinary bills. I looked for a Kennel Club approved breeder where one knows certain standards have to be met. 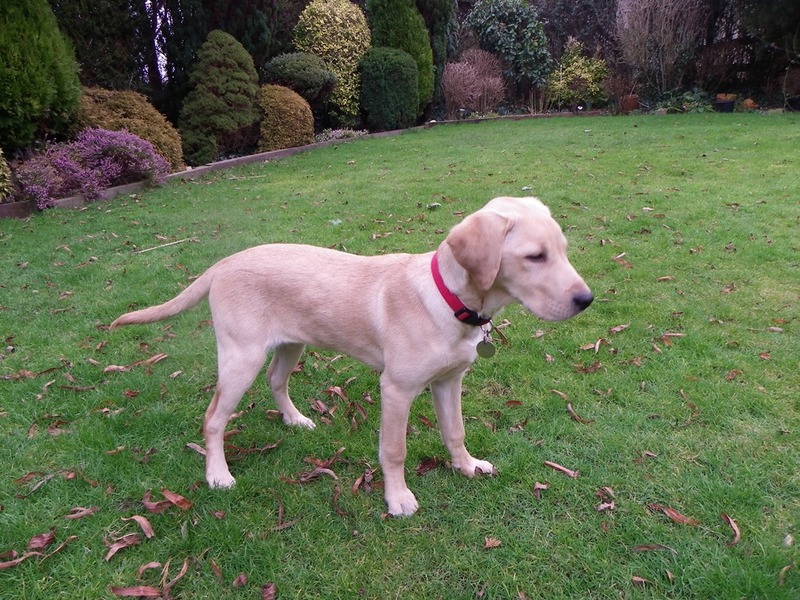 I also saw my puppy at various stages, when she was three and six weeks of age before collecting her when she was naturally weaned from her mother at eight weeks. Again I was fortunate enough not only able to see her parents but her grandparents too. Dogs can suffer from a condition know as dysplasia, (Hip Displacement), caused by poor genetic breeding. Although it is not possible to tell whether a puppy will suffer from this condition, it is possible to use a method known as hip scoring on the parents involving hip x-rays which are then rated by a panel of experts. The lower the score of a parent, the lower the chances of their off-spring developing the condition. Fortunately both my puppies parents and her grandparents too had low hip scores. 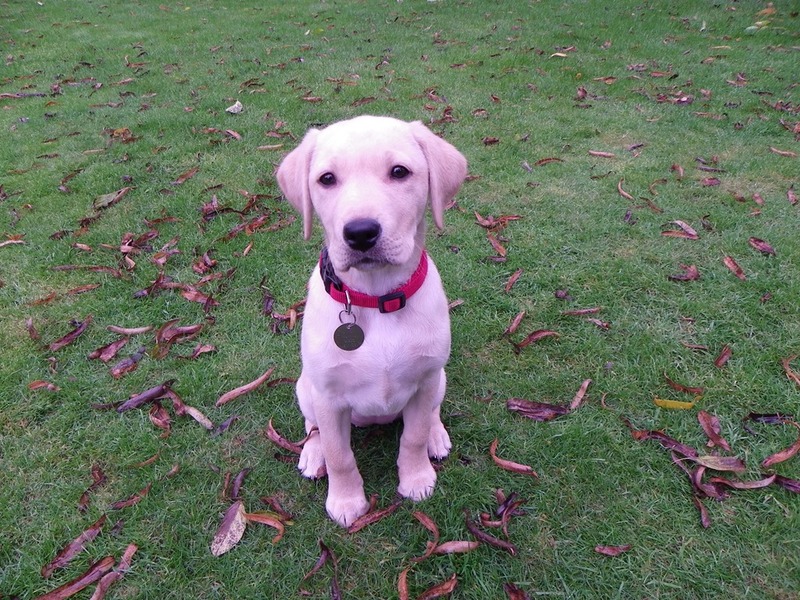 Chipping, (a small electronic chip the size of a grain of rice), took place when my puppy was six weeks old and vaccination shots with a booster two weeks later occurred at eight weeks.Chipping is not yet compulsory but I think it should be. Apart from greatly assisting the return of a dog to its owner in the event it gets lost, as the chip identifies the owner, it should help stamp out those who buy puppies on the spur of the moment only to abandon them later because they had not fully thought out the consequences of ownership. Since my puppy came into my home, it has been something of a rapid getting to know and understand each other phase for both puppy and the family. Rapid growth in a short time has transformed my puppy from a hold in the palm of the hand size when I first saw her to a much larger animal. It does seem as if she is literally growing before my eyes. Each day brings new experiences for her and she has already successfully completed puppy training classes. These classes are important not only for what the puppy and owners can learn, but they also provide all important association experiences for the puppy with new people and their own puppies. Puppies that learn to associate with others at an early age are less likely to be aggressively defensive each time a new person or animal appears on the horizon. I have grazing farmland surrounding my home with wide open fields. One boundary of my home adjoins a field in which sheep are rotated for grazing purposes. My puppy has already encountered the sheep and she sits at the fence watching them with curiosity. While sheep naturally tend to give dogs a wide berth, I now feel it is unlikely she will go chasing them in later life having already experienced them. I do so love walking in the felids with my dog. The views from the gently sloped hills give one a gratifying feeling of how this country used to be before the rise of the big cities.Its great for the dog too being able to run around unimpeded by a leash but I always ensure there is no livestock in the field first. Trips to the coast have yet to come for my puppy but if past experience with Labradors is anything to go by, the saying “Like taking a dog to water” will ring true.